How to recover suddenly disappeared contacts from iPhone? Contacts suddenly disappeared, how to recover from iPhone? How to recover iPhone suddenly disappeared contacts? Here are methods to help you get back lost contacts from iPhone. Today, almost all of my contacts have suddenly disappeared from my iPhone 6 with iOS 9.1. I can see only phone numbers, but when I want to add a contact when creating a new message (sms, iMessage) I can see all contacts, that is strange. Everywhere else are only numbers (contact, call history, etc.). The contacts are stored on Microsoft account which is set to default and I had no problems until now. I even didn't change any settings and it happened all of sudden. It is really frustrating, I didn't change any settings and this has happened. Could someone help me please? So mysterious. All contacts are just disappeared from iPhone suddenly. Is there any way to recover suddenly disappeared contacts on iPhone? Generally speaking, if you have an iTunes or iCloud backup for those lost contacts, you will be able to restore contacts from backup. The question is, when you restore contacts from iTunes or iCloud backup, you get the whole backup data to your iPhone, which will erase all data on your iPhone. In other words, some data on your iPhone will be wiped by data from backup. That's why you need iFonebox to recover disappeared contacts from your iPhone directly. It is known that iFonebox is a professional iOS data recovery software, which is able to recover deleted or disappeared contacts from your iPhone or iPad directly. 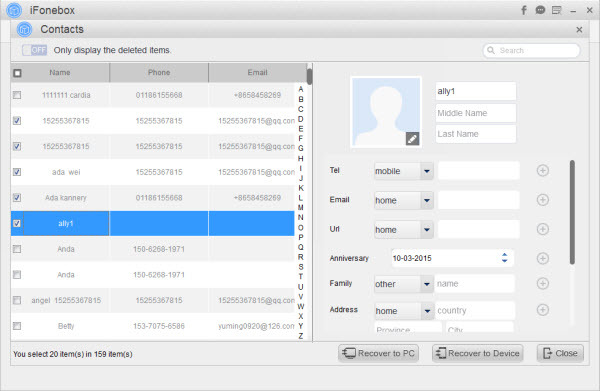 Plus, with it, you can extract and restore lost contacts from iTunes or iCloud backup selectively. One more thing, iFonebox is powerful enough to transfer all recovered contacts back to your iPhone again. Also, other data like notes, messages, photos, WeChat messages, etc, from iPhone, iPad and iPod touch can also be recovered by iFonebox. So cool. It is necessary to download and install iFonebox on your computer. Two versions are available: Windows version and Mac version. --Run iFonebox. Choose Recover from iOS Device mode. Please plug in your iPhone to the computer with USB cable. Once connected successfully, your iPhone will be detected by iFonebox. Click Start button to go. --Scan contacts from iPhone. Click on Contacts item to start the automatic scanning and analysis process. --Preview and select deleted contacts to recover. After automatic scanning, you have the chance to select those suddenly disappeared contacts and then, click Recover to Device button to retrieve all lost contacts back to iPhone. Notes: if you have an iTunes or iCloud backup for your disappeared contacts, just choose Recover from iTunes Backup or Recover from iCloud Backup to extract and restore contacts from backup to your iPhone.